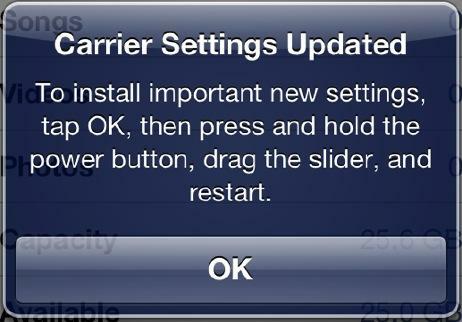 According to Apple's support page regarding the fix, the carrier settings update resolves an issue where some iPhone 5s "may use Verizon cellular data while the phone is connected to a Wi-Fi network." Update: In a statement to The Loop, Verizon said that customers will not be charged for "unwarranted cellular data usage." The update comes after a number of iPhone 5 users took to Apple's Support Communities webpage to complain that their newly-purchased handsets were racking up data usage charges despite being connected to functioning Wi-Fi networks. In the 8-page thread, some owners speculated the issue was related to iOS 6, while others claimed it was a hardware problem with Apple's new handset. While Sunday's update is for Verizon Wireless customers only, some thread posts noted similar issues with AT&T as well, however the validity of their claims have yet to be verified. In a separate thread, owners of older iPhone models, especially the iPhone 4 and 4S, have also complained of excessive data use after installing the latest iOS 6. The issue doesn't appear to be tied to a specific carrier, and recent posts point to data usage peaking during overnight hours. It is unclear whether Verizon will be refunding users affected by the unintentional data usage, and Apple has yet to announce what exactly caused the issue.